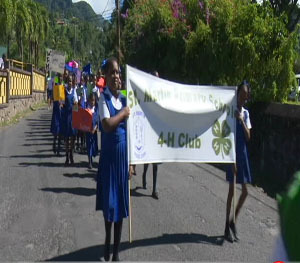 The Drug Prevention Unit on Friday collaborated with a number of schools to march through the streets of Roseau as they sought to bring awareness to the fight against drug abuse among Dominican youth. The Drug Prevention Unit is observing January as drug awareness month under the theme ‘listen first’. Friday’s activity, dubbed ‘march and honk’ is one of a series of activities organized to strengthen the voice of young people on issues surrounding drug abuse. Drug prevention officer spearheading the ‘March and Honk’ initiative, Malcom St. Rose , said this activity consolidates some of the other classroom activities previously held with the students. “The children of Dominica are saying they are tired of being frustrated by what they see in society…,” he said. St. Rose says the ‘march and honk’ event is keeping in line with the theme for drug awareness month and specifically aims at allowing students to voice how drug abuse affects them. He commented that the unit is hopeful that these kinds of activities will assist in creating a foundation within the students which will hinder them from experimenting with drugs at an early age. Schools who took part in the street march included the Canefield/Massacre primary school, St. Mary’s Primary and Convent Preparatory.